Having missed out on the aurora produced by one of the most interesting sunspots of the past few years by at measly 15 minutes, I was determined to catch some green the next time I had the chance. 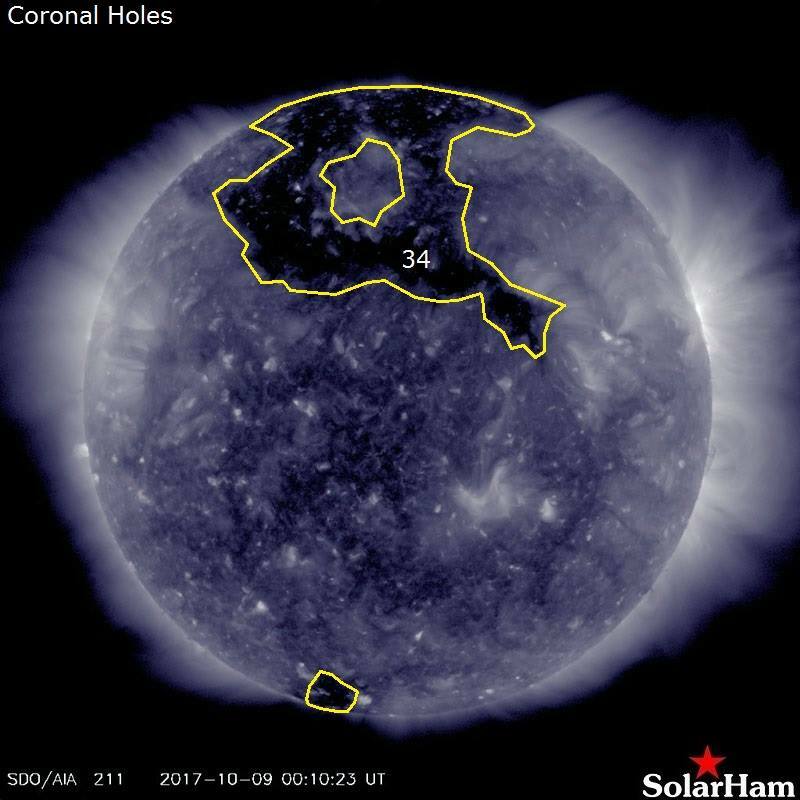 And that next chance was courtesy of Coronal Hole 34 that spun into an interesting position on Monday 9th October. In this blog, I’m going to take you through the forecast and the stats, and match those up to what I was actually seeing on Wednesday 11th October, and I’ll do so using my three questions I always ask myself when making a forecast. Monday 9th: is it possible? A coronal holes are slightly cooler areas in the Sun’s corona and, crucially, they have open magnetic field lines (rather than magnetic loops that are found on other places in the corona). This allows the solar wind to escape more easily here and is one of the things that can enhance the solar wind, increasing its speed - and giving us a chance of an aurora. This feature is known as a Coronal Hole High Speed Stream (CH HSS). On Monday 9th October, a coronal hole, rotating with the Sun, spun around to face towards the Earth. This sprayed out a continuous stream of faster solar wind towards us. At least, kind of towards us, for the coronal hole was towards the north of the Sun, meaning it wasn’t pointing directly towards the Earth. Still, it certainly was enough to suggest the possibility of enhanced aurora action for us. Was it possible? Yes. Given the its speed, it would take a couple of days for the plasma heading out with the solar wind to arrive at the Earth, so it was all eyes on Wednesday night to see if the promise would deliver. Tuesday 10th: is it probable? And, indeed, around 19.00 hours on Tuesday, the CH HSS arrived as measured by DSCOVR satellite (a satellite about an hour’s journey time for the solar wind from Earth that analyses the solar wind as it passes by). The speed jumped up from ambient levels of around 300 km/s to close to 400 km/s and the density sat at around 10 (reasonable values). The faster the solar wind speed, the more energy it hits our planet with, and the more likely an aurora is. Faster and denser is better, in this case. That said, 400 km/s is not hugely fast for a solar wind speed. So, we would need something more to give us a good chance. Enter the Bz. As well as the speed of the solar wind being important, its magnetic orientation is important too. The solar wind has a magnetic alignment built into it. And our planet has a magnetic field too. To get the aurora moving far enough south for it to be visible over all the British Isles, these two magnetic fields need to be in alignment with each other - this happens when the Bz is negative. So, for aurora, minus is better, and the further minus it goes, the better. You can see from the graph that we were getting periods of negative Bz. In fact, it was jumping up and down between positive and negative, something that helps stir up the magnetic field of our planet. One other thing about the magnetic field - the Bt. The is the strength of the magnetic field in the solar wind. In this case, stronger is better (the Bz cannot be more than +/- the same value as the Bt, so it acts as a cap on the Bz). The graph shows the Bt rising up to nearly +10. For my latitude, this is just okay, not amazing. We were clouded out on the Tuesday, so all of this data was pretty much academic. Anyway, I thought to myself, the stats aren’t currently amazing, so I’m probably not missing out on much. Wednesday 11th: is it probable? But the forecast for the Wednesday was much more promising. And, as we came towards evening, the stats looked not bad. The Bt still sat around 10, and the Bz was jumping up and down between around -8 to zero and back, stirring up the magnetic field. Both density and speed remained elevated and in fact the speed jumper up to around 450 km/s. None of these stats on its on was amazing; but I still felt there was a good chance of an aurora that night, even if it was only likely to be a modest one. How come? Importantly, what these graphs allow you to do is to see how the solar wind has been changing over time. The antecedent conditions of the solar wind feed in to the Earth’s magnetic field. The fact that the conditions had been quite favourable for a while was increasing the chance of activity - especially what the Bz was doing. This is one of the main reasons why getting to grips with the data is better than simply relying on app based alerts which mostly are based on what is currently happening. Get to the original data - teach yourself, and equip yourself! Based on all of this, I felt at least a modest display was likely. And, with clear skies, off I set for Portmuck, Co Antrim. Wednesday 11th - is it here? The magnetometers show the reactions of the Earth's magnetic field to the solar wind all evening. For the final of my three questions, we come from space back down to Earth, and to the magnetometers. These devices measure how the magnetic field of the planet is reacting. And, in this case, the greater the amplitude of movement, the better. Around 18.00 BST, even before dark, the mags started twitching, and I new we we very likely to see action from darkness. And, indeed, that was the case. As I arrived at Portmuck, I could see with my eyes a slight enhanced band along the horizon, an off-white colour to the naked eye. But I knew exactly what I would see once I pointed my camera towards the north. And there it was, glowing green. 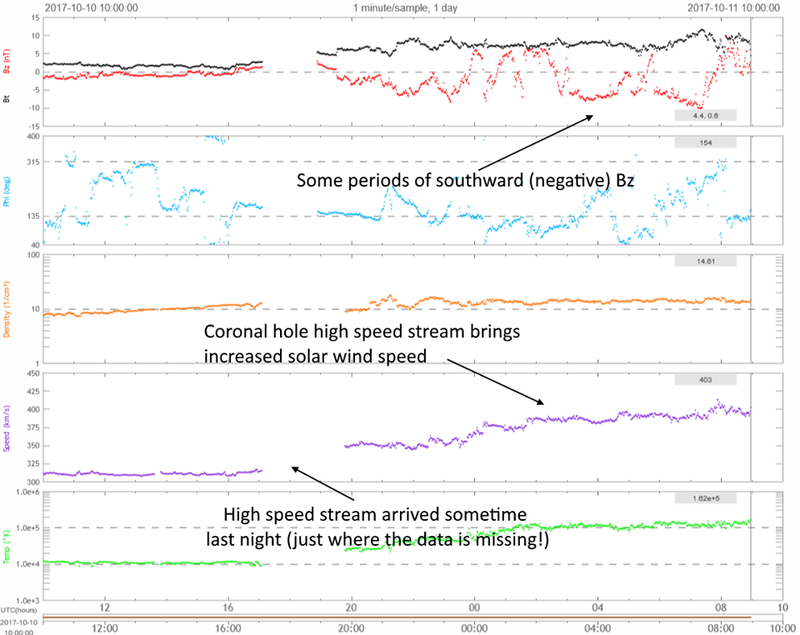 For the rest of the night, the solar wind didn’t change much. Speed and density remained the same, the Bt sat at 10, and the Bz jumped up and down a little. Enough to keep things ticking along, but never for it to take off into an amazing display. The band of green stayed there the whole night, sometimes getting a little bit more intense, with the odd hint of pillars, sometimes fading back. But there, all evening, until I wrapped up close to midnight as the rising half Moon washed out my view. And my view was exactly what I would have expected given the stats from DSCOVR and the magnetometers. Interestingly, though, when I looked at one of the aurora apps, it had suggested I shouldn’t have seen what I was seeing. Shows you again - get back to the original data and make your own forecasts! These apps do a good job, and are a fine thing to use if you’re just starting out. But there really is no substitute for the actual primary data and your own understanding. In particular, watch what the solar wind has been doing for the past while, as it can feed into what you are likely to see in front of you at any given time. Despite this app telling me that I shouldn't be seeing the aurora, there it was, in plain view, right in front of me all night! Get back to the primary data!